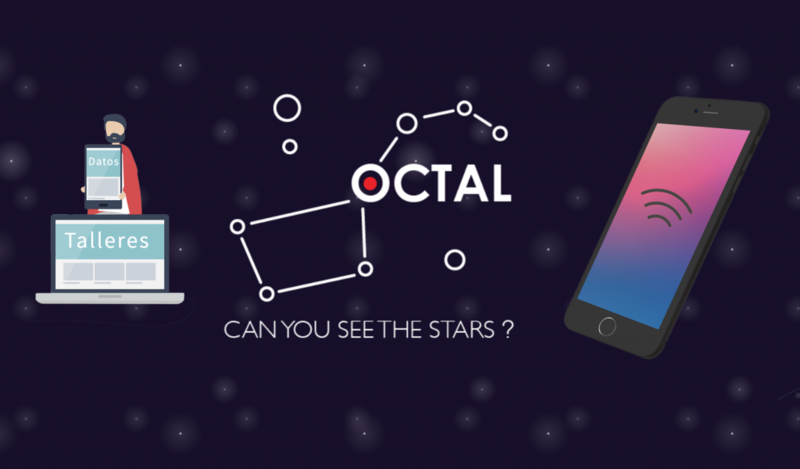 Octal is a light pollution initiative that is part of the STARS4ALL program. It is born with the objective of developing citizen data science experiences in which people from all over the world can participate in workshops to receive training on the collection, analysis and visualization of light pollution data. These workshops have different training strategies, such as creating observations in the night sky where communities collect data in situ to measure light pollution using a device designed by Octal; or workshops where people analyze their own data and other publicly available information about light pollution to create data visualizations. Octal develops night sky observation experiences using an open-source spectrometer. This device takes qualitative and quantitative measurements of light pollution in situ. Originally created by Public Lab, this spectrometer was modified to measure light pollution using a mobile phone in two ways; Start counting, and measure the light spectrum. The data collected through the device is analyzed at Octal workshops to determine and compare light pollution levels in different urban areas.